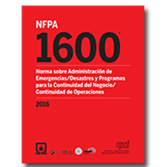 Update your knowledge about disaster prevention, mitigation, preparedness, response, continuity, and recovery with the latest Spanish edition of NFPA 1600®. Be prepared for any type of crisis or disaster -- resulting from natural, human, or technological events -- with the Spanish NFPA 1600: Standard on Disaster/Emergency Management and Business Continuity/Continuity of Operations Programs. Widely used by public, non-profit, nongovernmental, and private entities on a local, regional, national, international and global basis, NFPA 1600 continues to evolve as a vital guide for the development, implementation, assessment, and maintenance of disaster/emergency management and continuity of operations programs. Specific hazards -- geological, meteorological, biological, accidental human-caused, intentional human-caused, and technological – are clarified to assist evaluation during the risk assessment required in Chapter 5: Planning.